The Council has passed the budgets for the upcoming fiscal year (July 2018 to July 2019). In recent newsletters we have reviewed the MCPS and public safety budgets. This week, however, we step back to review the overall fiscal picture. This was a restrained budget year as the Council grappled with revenues that were lower than anticipated and only allowed for an increase in expenditures in a few highest priority areas. Although the local economy continues to perform well with low unemployment, strong job growth, and rising incomes, tax revenues have remained below expectations. Tax revenues for this fiscal year are down $106.1 million from the budget we approved last summer. The revenue shortfall stems in large part from a significant decline in revenue from capital gains, but other revenues were softer than expected, too. Recognizing the need to get ahead of the problem, the Council approved over $125 million in reductions to the FY18 budget mid-year. While revenues are below expectations, they did allow for a modest increase in FY19, which through the budget process was almost entirely devoted to MCPS. The Council did not raise taxes in this year’s budget. In fact, the weighted average real property tax rate fell by 1.98 cents this year, and by a combined 4.50 cents over the past two years. The property tax will generate approximately $1.8 billion in revenue, about a third of total revenue. The next largest revenue source is the income tax at an estimated at $1.6 billion. The income tax rate remains unchanged. Read more about the Council’s decisions on the property tax here (pdf). More information on the other revenue sources can be found here (pdf). What does this all mean for the average household? Adjusted for inflation, the County share of taxes relative to personal income has remained virtually unchanged for the last five years. The operating budget for the upcoming year totals $5.6 billion, a 2% increase from the previous year. There are real differences though by agency. MCPS expenditures will rise by about 3%, Montgomery College will rise about 1%, and Montgomery County government (provider of public safety, libraries, HHS and other services) will rise at 0.2%. I always find that the rate of increase overall is the most useful number to focus on when trying to understand the overall budget picture. This year’s increase, 2% overall, is very modest. Consider that in 2004, 2005, and 2006, the County budget increased by over 10% annually each year. You can find a rough breakdown of how expenditures are programmed in the chart below. 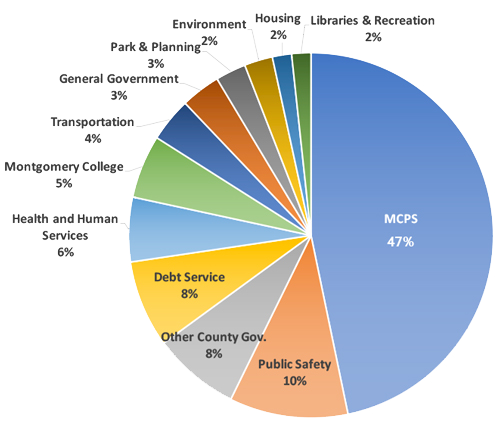 The chart above demonstrates our priorities: MCPS funding is about half of all County spending with the next largest program being public safety. Debt service, though, is not far behind, which is why we are reducing our borrowing levels in our capital budget. This Council strengthened its commitment to fiscal discipline in this budget, by setting aside additional funds for our reserve. By adding enough new funding in this budget to have a fund equal to 9.4% of our revenues, the County stays on track to meet its 10% goal by 2020. After making adjustments to our retiree health fund (OPEB) for the FY18 revenue shortfall, we also fully funded our FY19 commitment to OPEB. Sufficient monies in reserves are critical for us to weather downturns in our revenues, which we have experienced regularly over the years — including this past year. Healthy reserve funding helps the County maintain our coveted AAA Bond Rating, the highest possible. The AAA Bond Rating means we get the lowest interest rates, allowing us to build more schools and facilities with our capital funds. The Council produced a budget that is restrained and responsible and meets critical goals for fiscal discipline. It does not raise taxes, and ensures the County will continue to provide the superb services that so many of our residents appreciate so much. Next week we will turn to budgets for transportation and parks. Stay tuned. This Thursday, May 24, the Council will formally approve the budgets for the upcoming fiscal year. The Council has worked hard and collaboratively throughout this process. With our remarkable staff and engaged community, we have produced a budget that is restrained and responsible, does not raise taxes, and ensures the County will continue to provide the superb services that so many of our residents appreciate so much. I credit the County Executive with making many great decisions in his budget, including fully funding Montgomery County Public Schools (MCPS). The County Executive’s budget also presented some daunting challenges in public safety. Faced with cuts that would have negatively impacted fire and rescue service in Germantown, Hyattstown, and Silver Spring, the Council found a way to change priorities to fund over $7 million for critical public safety services. This amount was about half of all of our adjustments, demonstrating the importance we place on the issue. People take for granted that when their house is on fire, or when their spouse has a heart attack, that someone will respond quickly. We prioritized that quick response time in this budget. Last week we reviewed some highlights from the MCPS budget; this week we take a closer look at public safety. The County Executive’s recommended MCFRS operating budget totaled $211 million, down 1.7% from last year. This would have cut a total of $3.5 million and 29 career firefighter positions from the Fire and Rescue Service. The most significant proposed cuts would have taken three response units out of service, including a paramedic engine in Hyattstown, a paramedic engine in Germantown, and an aerial tower in Hillandale. Together, these cuts totaled $5.8 million. All three cuts would increase response times in the response units’ first due areas. Hyattstown and Germantown each would have increased from 6-8 minutes to 10-12 minutes. Hillandale response times for an aerial unit would have increased from eight minutes to 12 minutes. While the County Executive had a plan to transfer firefighter positions to mitigate the increased response times, the Council ultimately chose to restore funding for all three response units and provide funding for additional staffing in Burtsonsville and for volunteer firefighters. All in all, the Council provided an additional $6.5 million to Fire and Rescue. The County Executive’s recommended Police budget totaled $279 million, up 1.5% from last year. The Police Department budget was one of the few public safety budgets that had a budget increase for FY19. However, the County Executive’s proposed budget did not include any new police officer positions, and in fact, it lapsed six police officer positions for the year. The Council discussed School Resource Officers at length, given the “Maryland Safe to Learn” act that the General Assembly just passed this year in response to the recent school shooting in St. Mary’s County. Currently, the SRO program, which includes not only MCPD officers, but also officers from the City of Rockville Police Department, City of Gaithersburg Police Department, and the Office of the Sheriff, provides 27 officers and deputies assigned to each County public high school. These officers are also responsible for assisting with any issues within their respective middle schools. The new state law, however, requires that each Maryland jurisdiction has either an SRO or “adequate local law enforcement coverage” at every school for the 2019-2020 school year. Given the complexity and reach of the new state law, Council committees will examine the law and its mandates in more depth on July 19. This year, however, the Council added three new SRO positions that will be assigned to middle schools. The Council also added one new vice unit detective position that will address human trafficking concerns in the County. The County Executive’s recommended Sheriff budget totaled $23 million, down 1.1% from last year. An important issue for the Sheriff’s Office this year was body worn cameras. In October 2017, the Sheriff’s Office took advantage of a free body worn camera pilot program offered through Axon, the vendor who supplies body cameras for the County Police Department. The Sheriff’s Office has 162 deputies who are outfitted with body worn cameras. These cameras are important both for accountability as well as safety purposes. Deputies are often in potentially volatile situations while serving domestic violence protective orders and mental health-related emergency evaluation petitions. This risk is especially true after the General Assembly passed additional domestic violence and gun control laws, such as the “red flag” law (HB1302) that permits the Sheriff to confiscate guns from individuals who have been deemed by the court to be an extreme risk to self or others. The Council approved an additional $229,903 to permit the Sheriff’s Office to maintain the program through FY19. The next few weeks we will continue our exploration of the County budget. Stay tuned. … find out what items and grants the Council added to the budget? Although the County Executive sent the Council a very good budget, the Council has the final say. The Council reconciles competing community priorities and available resources through its “reconciliation” process. This year, the Council was able to identify almost $15 million in resources to invest into critical services identified by the community. The Council also programmed over $2.8 million for grants to non-profits in the County. Check out the details here. The Council’s review of next year’s operating budget is about to begin. On Thursday, March 15, the Council will receive the County Executive’s recommended operating budget for the next fiscal year. This budget proposal, covering July 2018 to July 2019, is the starting point for Council deliberations. The Council makes the final decisions, and we invite you to be part of the process. In the coming weeks, take some time to review the Executive’s recommended budget, using our Open Budget tools. Then, participate by emailing the Council with your views at County.Council@montgomerycountymd.gov, signing up to testify at public hearings, scheduling meetings with Councilmembers, or by calling 240-777-7910. On social media, use #MontCoFY19. At the Council session on Tuesday, we will continue our work on the County’s Capital Budget (CIP) with a focus on projects affecting WSSC, Public Safety, and Recreation. Legislation to create a “Ready to Learn” program for low-income children will be introduced. Committees will take up many substantial issues, from food security to affordable housing to transportation projects to the use of road salt. Finally, on Wednesday March 14 at 7:30 p.m., the Council is hosting a town hall meeting at the White Oak Community Recreation Center in Silver Spring. All County residents are invited to attend and speak directly with Councilmembers about community priorities. In-person public hearings are one way to express your views to the Council. Our online signup is only clicks away! Simply navigate to the County Council Public Hearing website, find the public hearing you are looking for, and click “Sign Up.” A new window will pop up (make sure your browser allows pop ups), and you will be asked to fill in some basic details.